In 2004, we wanted to dominate our matches by being able to climb the six-inch platform, hang from the chin-up bar, and push balls into our ball coral. 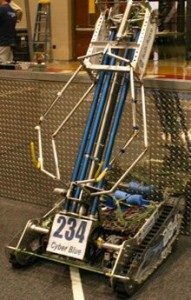 We accomplished these tasks by using two-inch bore pneumatics to extend and retract our arm after we climbed to the top of the platform with our aggressive drive train treads. The focus of our strategy was to make sure we ended the match hanging from the chin-up bar to score fifty points. With our 24-inch pneumatic and 6-inch pneumatic pushing against each other, we created enough force to pull ourselves up with ease. This was the one constant throughout the 2004 season. If we were going to focus on hanging from the chin-up bar, then we had to make sure we could get onto the platform. We prototyped and tested every design we could come up with. The results clearly showed we needed treads, but we didn’t just use any tread. We used an aggressive Kevlar tread. These treads never failed.